Experience the vibrancy of Dubai with a Fairmont stay, right in the heart of this unique city. The hotel is situated 10 minutes from Dubai’s largest shopping centre, The Dubai Mall, and the impressing man-made structure, Burj Khalifa. 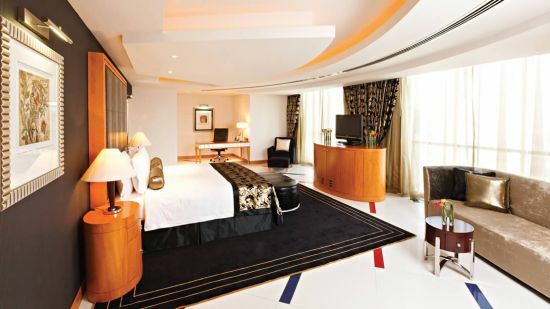 Within this opulent hotel are 394 guestrooms and suites uniquely furnished and featuring high-end design and amenities; the two bedroom suite and Fairmont Gold privileges are the pinnacles of a Fairmont Dubai stay. Personalised services, the President Club and a wide array of sports and fitness, spa pampering, and lavish dining ensure the 5-star treatment continues both in and out of resort. Indulge in cocktails by the rooftop swimming pool with stunning views of the Dubai skyline; enjoy lavish evenings and fantastic nightlife at the Cirque Le Soir or the stylish Cavalli club. 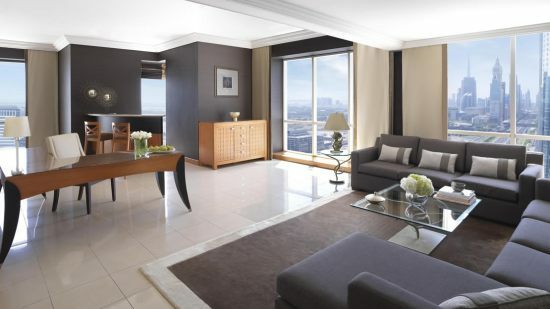 Fairmont Dubai is a world of contemporary and elegant pleasure for many discerning guests. Let Destination 2 serve you a slice of mesmerising Dubai. A complimentary shuttle is provided from the hotel to the Burjuman Mall and Mall of the Emirates, and the Dubai metro system is conveniently located opposite the hotel. 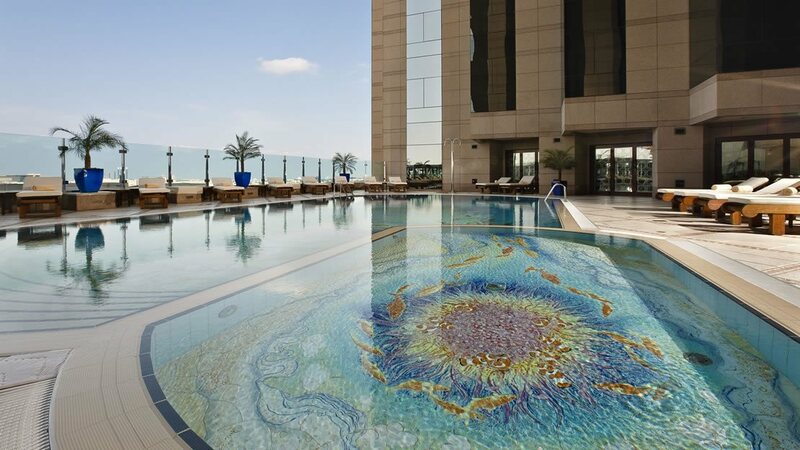 Fairmont Dubai is approximately 12km away from Dubai International Airport. Luxurious rooms and suites comprise many opulent touches such as granite floors, five-piece bathrooms, and panoramic views. 394 guestrooms, suites and Fairmont Gold privileges deliver optimal comfort and style. 41 square metres with city or poolside views. One king- or twin beds feature in these charming rooms boasting an elegant and contemporary décor. ‘Smart maid service’ door panel. 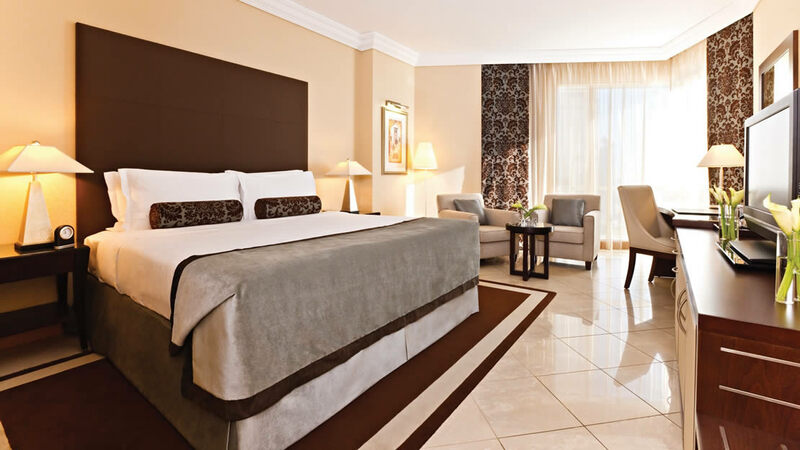 Offering a beautiful décor, floor to ceiling windows and spacious luxury bathrooms, these rooms feature a separate seating area, one king-bed and panoramic views of Dubai. Beautifully spacious and with an exceptional décor, these stunning one-bed suites feature separate seating and bedroom areas, a dining area to seat four and a luxury bathroom filled with high-end amenities. Superb views of the city can be enjoyed from these suites measuring 890 square feet. With a sumptuous king-size bed in each of the two-bedrooms, and two luxurious four- and five-piece bathrooms, there is plenty of opportunity to relax in complete privacy. A spacious living and private dining area with seating for six plus views of the rooftop pool ensure these 105 square metre suites ooze style and sophistication for the discerning guest. Perfect for families and those requiring added privacy, these spacious 136 square metre suites, feature a king-bed in each room, three 32” LCD TVs, master five-piece bathroom and a further four-piece bathroom in the main living area. The separate living area features sofas, bar area and dining table for six. 136 square metres of superb accommodation features breath-taking views of the Dubai skyline from panoramic windows, a spacious lounge with sofa, bar and dining area to seat six plus two exceptional en-suite bathrooms and an extra three-piece guest bathroom in the main living area. Luxury defined, the Royal Suite boasts a fabulous 325 square metres of living space on the penthouse floor, three custom designed bedrooms, VIP amenities, on-call butler, and full bar setup for private events (additional charge). A stunning living area with private dining and two elegant lounges, four bathrooms and an open kitchen is stylishly furnished with a contemporary feel. The most generous suite in the penthouse collection, 548 square metres of sheer opulence includes floor-to-ceiling windows running along the length of the penthouse for astonishing views. The space incorporates a rooftop terrace, sunroom and indoor Jacuzzi. The three bedrooms feature a king-size bed and the suite is fitted with state of the art Bose home entertainment system. 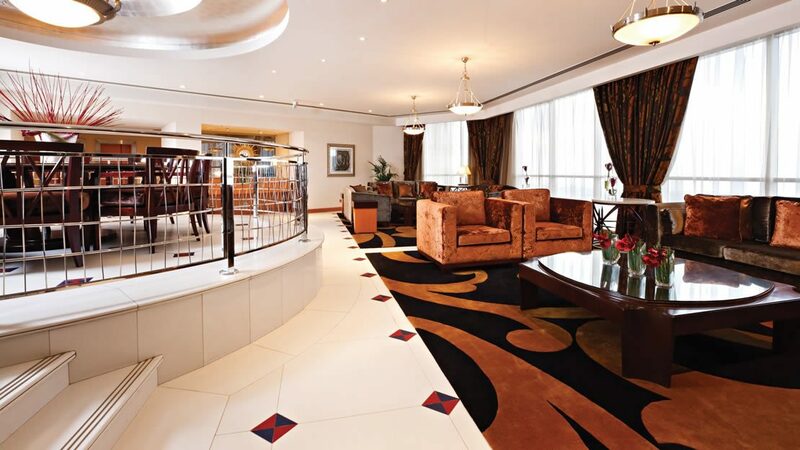 Beautifully luxurious and enjoying the most incredible views of the city, the Presidential Suite is furnished with a grand entrance hall, private dining and living area, and two beautiful bedrooms each with a king-size bed and stunning ensuite. On the 34th Floor, this 288 square metre retreat is superior in every way. A sensory experience, Fairmont Dubai offers exquisite French classics as signature dishes in addition to those with a twist. This is a Brasserie-style venue with a décor and design reminiscent of a stylish Parisian apartment. Signature cocktails are also served to complement the experience. Enjoy classic pub favourites as you catch up with the latest sporting events. Under a spectacular atrium, guests can relish delicious innovative cuisine from Arabic Mezzah to a combination of grilled specialties. The flavours of New York City come alive in this sultry and stylish venue. Meats and grills to sushi and delicate seafood. This is a trendsetting restaurant that’s sure to impress. Savour the delicate flavours of hand-made maki rolls, healthy salads and contemporary Japanese cuisine. Dokuz is a stylish rooftop lounge where Turkish inspired cuisine and barbecue delights are served against the mesmerising backdrop of Dubai skyline. In a pitch-black setting, exciting the senses without using sight, this adventurous concept is considered to be one of the top experiences in Dubai. This is a private restaurant where waiters use night vision goggles, and serve culinary delights of the finest quality. Eating on the go or catching up with friends, Pronto serves delicious snacks, pastries and cakes along with sandwiches and rotisserie chicken all combined with the heavenly smell of freshly brewed coffee. Considered to be the city’s best Steakhouse as mentioned in TimeOut Dubai magazine, guests can savour the premium gold Angus beef and succulent Wagyu beef. A variety of cuts and seafood to complement, this is a superb venue where alcoholic beverages and cocktails are also thrown in the mix. Bars and lounges include Cin Cin, The Cigar Bar, the stylish Cavalli Club and the fantastic Cirque Le Soir. Guests staying at Fairmont The Palm can enjoy Half Board or Full Board options.